Yes, I’m fortunate to have a job that has me jet setting across the world. Alas, business travel is a long way away from my day traveling as a woman of leisure. Although it sounds very glamorous, my weekends are spent on planes, my weekdays spent running around often unknown cities finding and attending meetings (Oh really? The city of Istanbul is situated on 2 continents?? ), and evenings are spent catching up on email floods. While I don’t get a chance to really immerse myself in any locale, I do get to see and experience a few things along the way. So these brief travels will be the theme of my “Fleeting Impressions” series. Please don’t rely on my writing to plan your next trip. Just sharing random thoughts (and instagram photos). 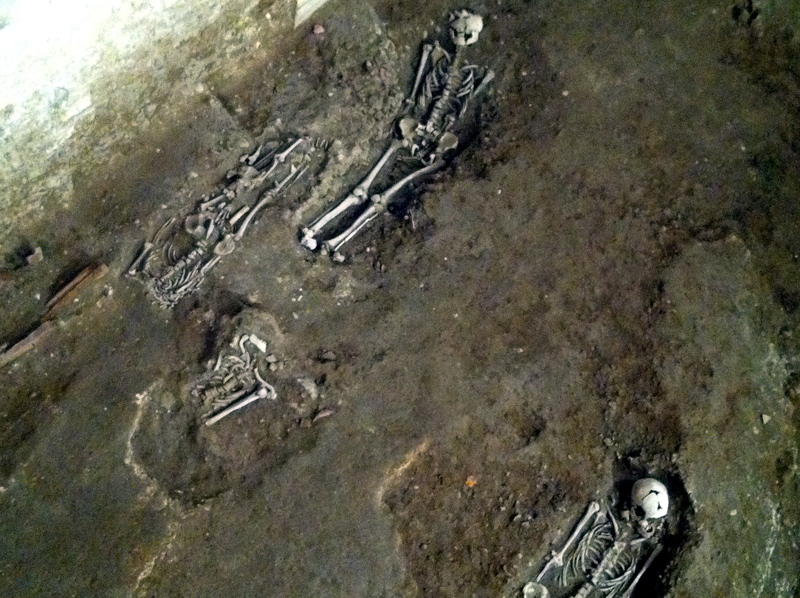 Today I was had the unique privilege of touring a yet-to-be opened necropolis within the walls of the Vatican, Via Triumphalis Necropolis. The Canadian Club of Rome was given this special access due to Canadian Patrons of the Vatican Museum. This amazing grouping of tombs dates back as far as the Augustan age (1st century AD) and spans until the age of Constantine (3rd century AD) and was discovered during the development of — a parking lot in the Vatican. 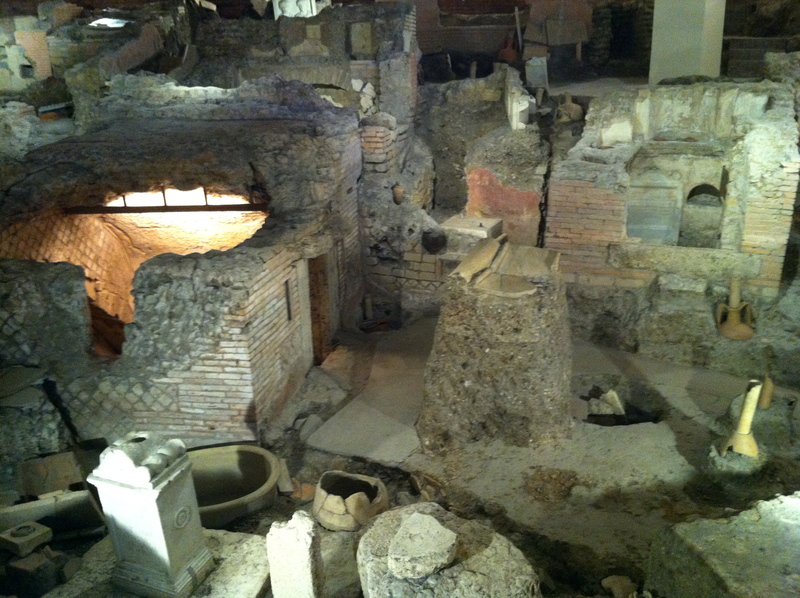 But through this nondescript entry, and under a parking lot, you walk into one of the best preserved burial sites of ancient Rome. It’s amazing to browse through these artifacts when they are displayed in their original settings. 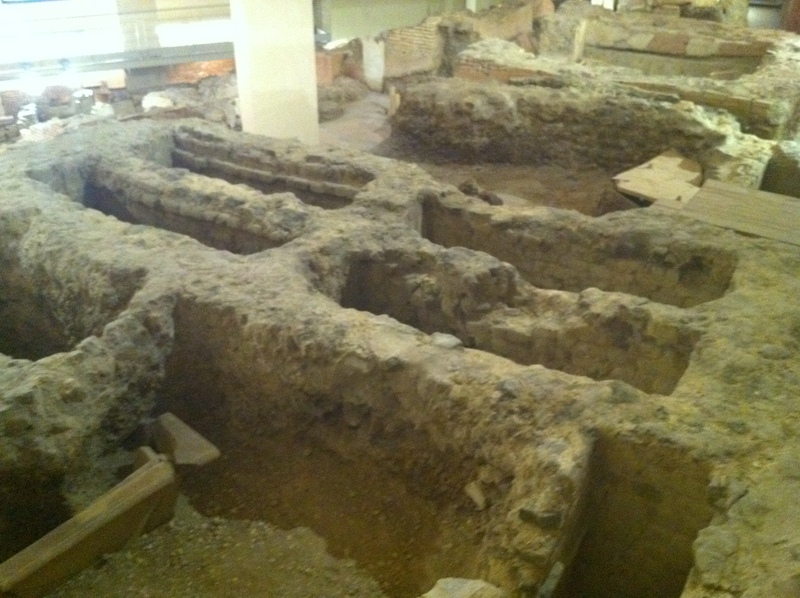 We learned that burial sites had built-in tubes so that relatives of the deceased could provide them with libations – liquid nourishment for the afterlife in the form of wine or mead. You can see them emerging from the ground. Amazing also to learn that once ancient Romans survived childhood they had a good chance of living into their 80s and 90s. Seems like access to fresh water and sanitation goes a long way towards longevity. Here are some shots of the day – it’s hard to convey how impressive this was. 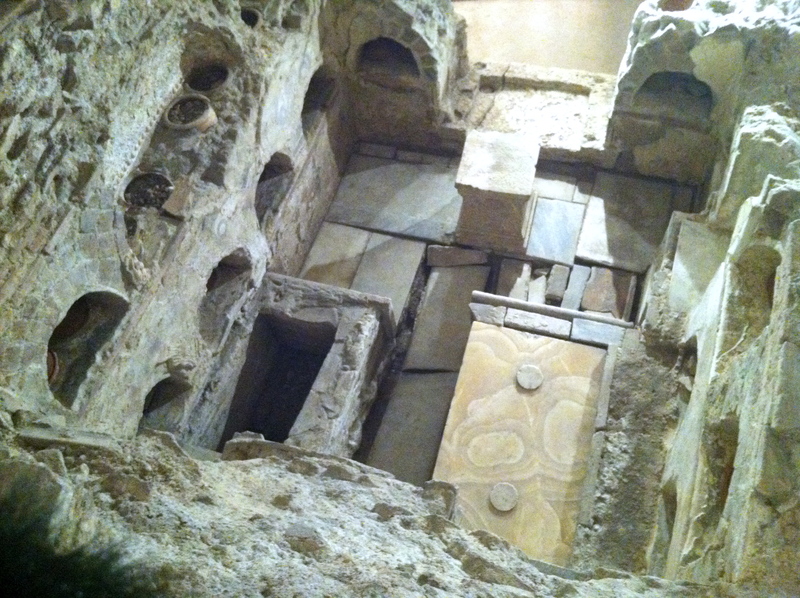 But what impressed me more was a comment one of my fellow Canadians made while we walked through amazing mosaics, frescoes and marble inscriptions….”what will be left of our current culture 2000 years from now? Plastic? 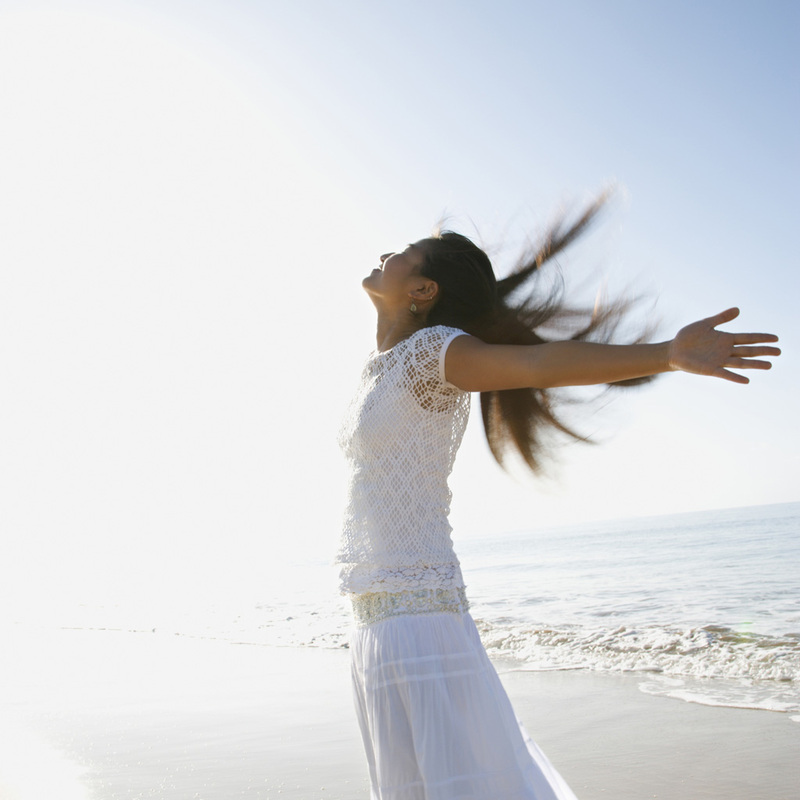 Toxins? Styrofoam?” Good question. Many people expressed surprise by my article comparing how similar China and Italy are from an intercultural perspective. Many similarities are values-based (ie family, social status), while there are more profound differences in outward expressions of culture (music, expressiveness). But I’ve just discovered new proof! Amongst Italian New Year’s traditions like eating lentils at midnight and wearing fancy new clothes out (to an overpriced event), is the ritual of wearing new red underwear! This is also a ritual in China, albeit only if it is the year of your “animal.” January 23, 2012 heralds the Chinese year of the Dragon, so those born in 2000, 1988, 1976, 1964, 1952, 1940, 1928 and 1916 (well done!) should technically wear red underwear all year to protect themselves from jealous spirits….but many just feel that wearing red underwear on Chinese New Year’s Eve will suffice. What would you do if your vacation date for a Romantic rendezvous in Rome doesn’t show up? You fly from across the Atlantic Ocean for a much-anticipated romantic rendezvous over the Christmas holidays. And your date doesn’t show up. Sure, he’s got his (alleged) reasons, but at the end of the day, you are looking at 10 days solo in Rome when you should be in doppio. It could have been the worst trip of my life. 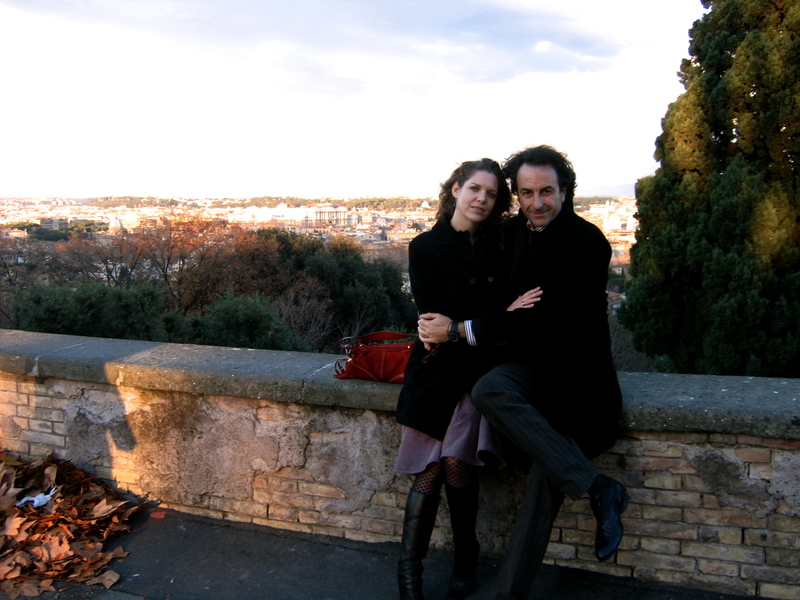 But instead, 5 years ago today I met the Italian love of my life, and this year I moved from Canada to Rome. 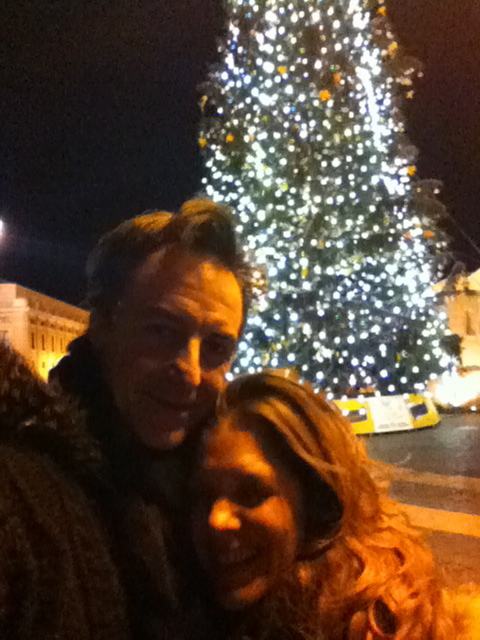 PS ladies, if you are going to be stood up on a date, I suggest you let that happen in Rome. Italian men will never let a solo woman feel unappreciated! 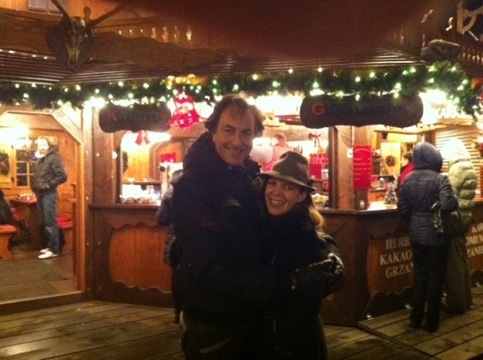 These past 2 weeks have brought me on a veritable tour of the Christmas markets of Europe. 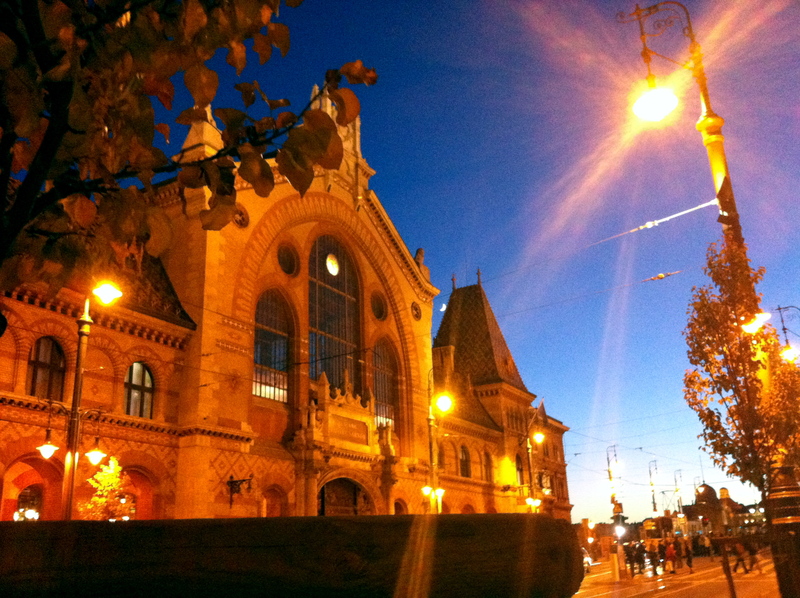 I travelled to Budapest, Bratislava, Brno, Prague and Warsaw. With the exception of Prague, all were cities I visited for the first time. Sadly my schedule prevented me from seeing much (OK, any) of the local sights. But I found much solace in wandering the streets of each beautiful city; following the trails of sparkling lights to find the Christmas markets scattered throughout. I guarantee you will not need to know how to pronounce it and you will have no problem finding many stalls offering it at very cheap prices (1 Euro in Bratislava), and many friendly locals drinking it at this time of year! Warm wine sweetened and spiced with lemon rind, cardamon, cloves and more is a sublime treat on a cold night. The local foods are another fantastic reason to spend time at these markets, and you can spend many hours wandering, nibbling and sipping under the lights and stars. At the end of November, Budapest’s Christmas market stalls (map: Vörösmarty Square) seemed as though they were barely getting started with only a few lonely shops in the midst of a boisterous central eatery. A shame too, as the few stalls that were open looked like they had the best array of unique local products, and not just the stuff you’d find in the tourist traps. Bratislava has not one but 2 Christmas markets in Old Town, one complete with a skating rink at Hviezdoslavovo Námestie – well done, Bratislava! 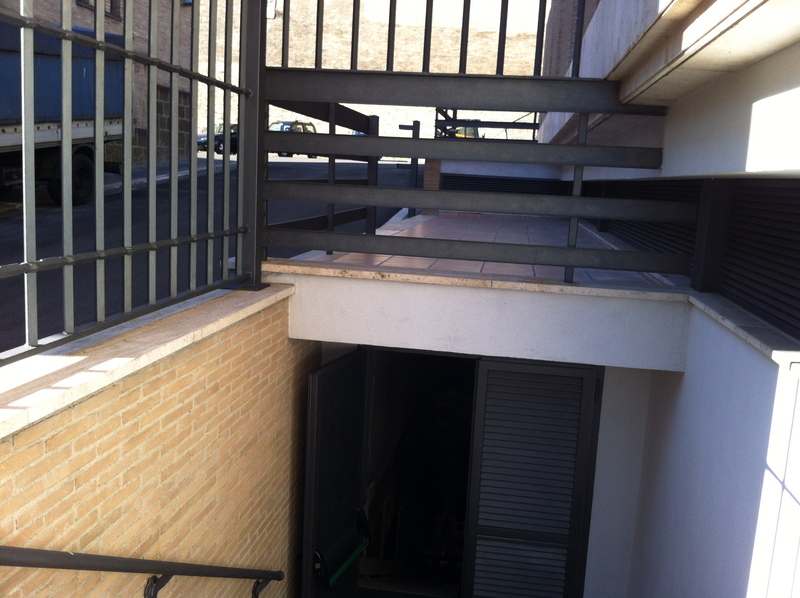 They are within easy walking distance, your varene vinowould not even get cold walking from one market to the other. I noticed that shops selling toys and non consumables closed down early, before 8 PM. 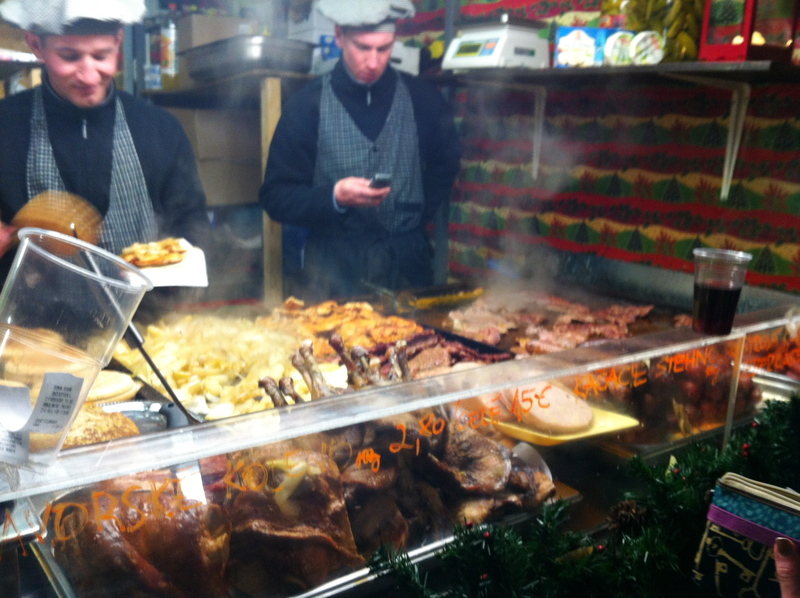 But for me the market in Bratislava was to marvel at the foods of my Slovak ancestors. I am surprised with all the Slovak foods I was raised on (Halušky, kapustnica, rosky) that I was never initiated into the delights of varene vino. And I am also surprised with all the fried meat that my grandparents were healthy enough to embark on their trip to Canada. 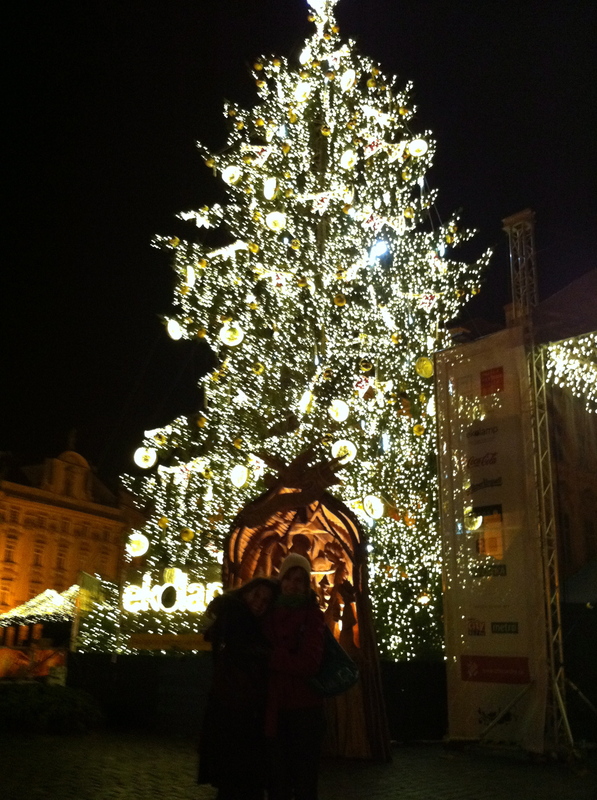 Prague seemed full of Christmas markets and vendors selling outdoors in its atmospheric squares. But the main event can be found in the Old Town Square where again mulled wine and hearty quantities of meat were the order of the day. I feel that Prague is one of the most astounding cities of the world, and its whimsical architecture makes the perfect fantasy Christmas backdrop. Finally, in the Christmas markets of Warsaw, in the Old Town Square and in the shadow of the uber communist relic Palace of Culture & Science, I discovered the most important rule of Chrismas markets – they are romantic! So bring someone to stroll with, even if he does not share your passion of varene vino. 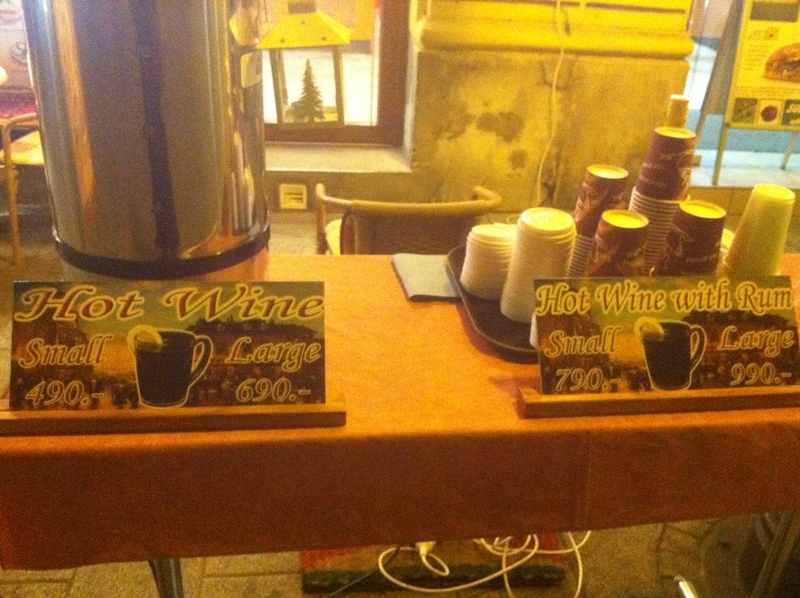 So, christmas markets in Europe, to sum up: shop early, bring your appetite and above all, get into the Christmas mood with some mulled wine. It’s easy to feel, compared to the great cities of Europe, that Canada is pretty boring. 2 days in Warsaw changed my mind. We Canadians & Americans imagine how fortunate those are who live amongst Europe’s historic monuments and architecture, but we rarely understand that there is a darker side of those historic neighborhoods. Here in Rome, monuments and triumphal arches thousands of years old illuminate wars and conquests of ancient heroes and villains. Yet, somehow it’s easy to reflect upon the glory of those ancient events, and not the agony they caused. Warsaw is very different. 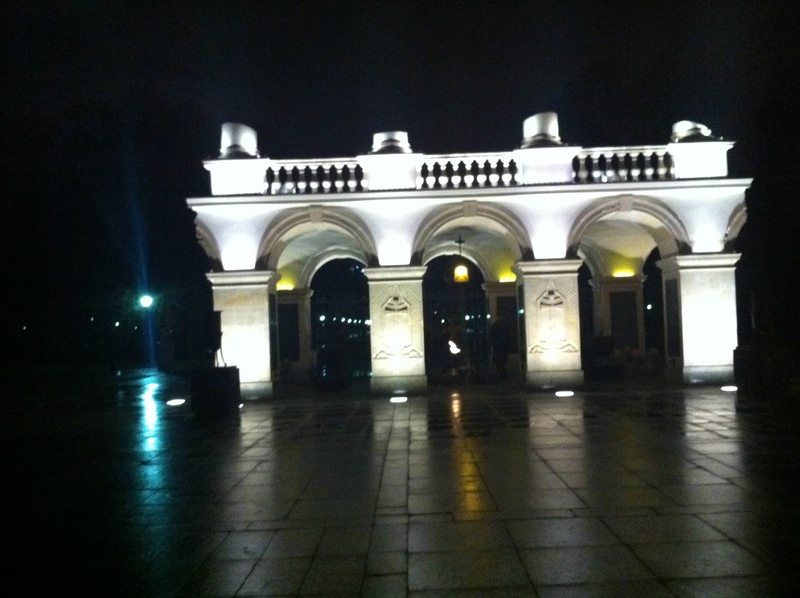 I didn’t ever stop to consider why Warsaw had not been on my list of top places to see in Europe. Perhaps I had just never been aware of anything really…famous…to see. And of course I knew that Warsaw had suffered in WWII, but hadn’t so many places? After my trip this week to Warsaw, I understand why. I am humbled by the story of this city, and I am grateful for the distinct lack of a history like Warsaw’s in my native Canada. I didn’t know for instance, that Warsaw staged one of the greatest resistances to initial Nazi invasion…in the 1939 Siege of Warsaw the Poles defended the city for 20 days before it fell to Nazi occupation. This is compared to the 9 days it took Paris to fall, despite being defended by the world’s largest standing army at the time. The siege was one of the first instances of terror bombing, where Nazis targeted hospitals, schools, marketplaces and columns of civilians leaving the city. Years later when the Nazis were starting to falter, in 1945 Warsaw staged an uprising that was eventually crushed. The result was that the Nazis not only systematically massacred the people but virtually 90% of the city as well. I didn’t realize that the “old city’ was actually a modern recreation painstakingly rebuild based on photos and descriptions…that virtually no buildings of historic and cultural relevance exist today as they were targeted in a brutal campaign of retribution by the Nazis against this heroic city that dared to resist. One of my older clients got tears in her eyes as she told me about this. And yet the people of Poland are very sweet; although there is sadness there is no bitterness and you get a sense of a city which is re-finding itself. 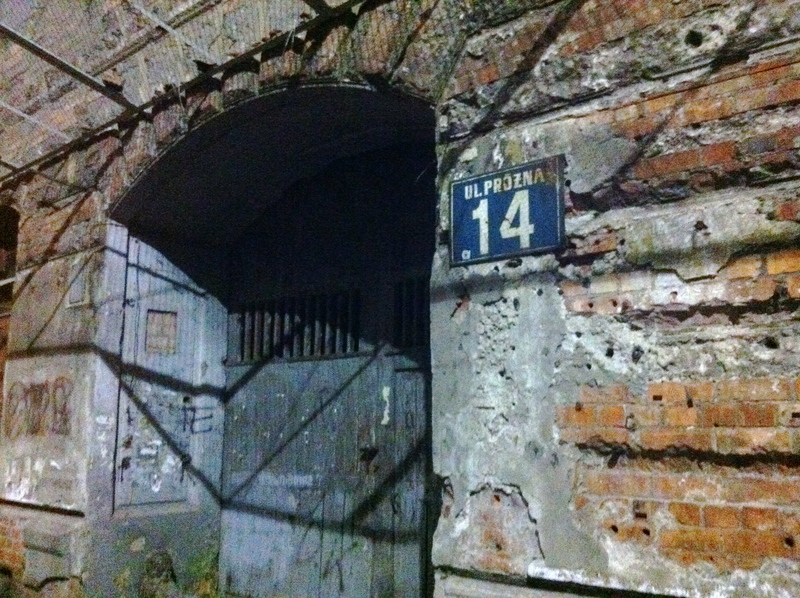 Remnant of Warsaw's horrific ghetto. You can still see bullet holes. It was a sobering reminder that the challenges and problems we sometimes face today are so insignificant….and how fortunate I am to have grown up in Canada. I don’t have a traditional commute (defined as a route I take the office daily), as I work from home. But more often than not, I am on the road and can define my commute as the path I take from my hotel to wherever I meet clients. And certainly even my home base of Rome makes for some of the scenic commuting in the world. 10 minutes early for a meeting? Why don’t I just nip into this 500-year old church with a Michelangelo sculpture? I consider myself extremely fortunate in that my work allows me to travel all over the world. This wanderlust can also be stressful, as most days I am trying to get to entirely new locations in unfamiliar cities in languages I don’t know. However, the languages I can manage with various degrees of proficiency: English, Mandarin, French and Italian – can take me quite far. As I write this over a quick meal, I recognize my coping strategy for a quick nutritious lunch in almost any city (as opposed to resorting to American fast food in Europe). Spending 2 days in Hungary has done little for my proficiency in the language, so ordering what I’d like, and making sure it can be delivered quickly can best be accomplished with that ubiquitous fixture of any city in the world: the Chinese restaurant. Anyway, while I am fortunate to travel to some of the most incredible cities of the world, my schedule rarely allows me to step into many sights. I expect I hold the world’s record for lifetime visits to Paris without seeing the Louvre (which distresses me greatly). But fortunately my travels allow me to do 2 of the things I adore the most abroad – walk around and explore neighborhoods, and enjoy a quiet dinner at a local bistro. For the last day and a half I’ve explored Budapest between appointments, and have been delighted by this city. Budapest was never at the top of my list of places to see – no particular reasons for this, it just never stood out for me. But I’m delighted to stumble across its charms. I don’t know the names of the buildings I’ve passed of their illustrious histories, but that detracts none from their beauty. I’ve stayed mostly in Pest; Buda is on the other side of the Danube River that slices in between the 2 historic twins. Throughout my wanderings in the city I’ve seen magnificent architecture throughout the city; a generally refined and elegant style that contrasts Rome’s equally delightful chaotic-ness. The pedestrian street that runs behind my hotel (Bohem Art Hotel – stylish & efficient with free wifi and great breakfast) that is lined with little vendors selling mulled, hot wine. If this blog had “Smell-o-Vision” you could experience the spicy sweetness that warms you as you pass by each vendor. 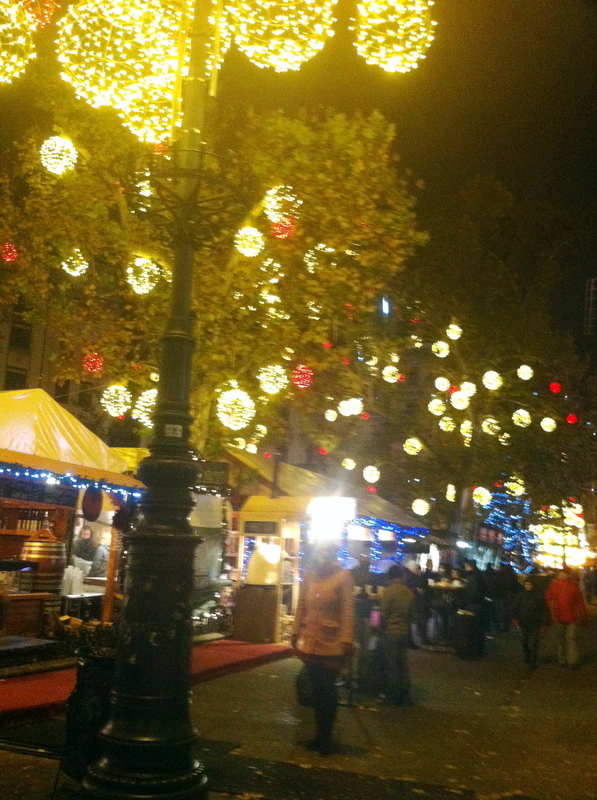 The pedestrian laneway runs to a Christmas market, which seems to be still getting underway. 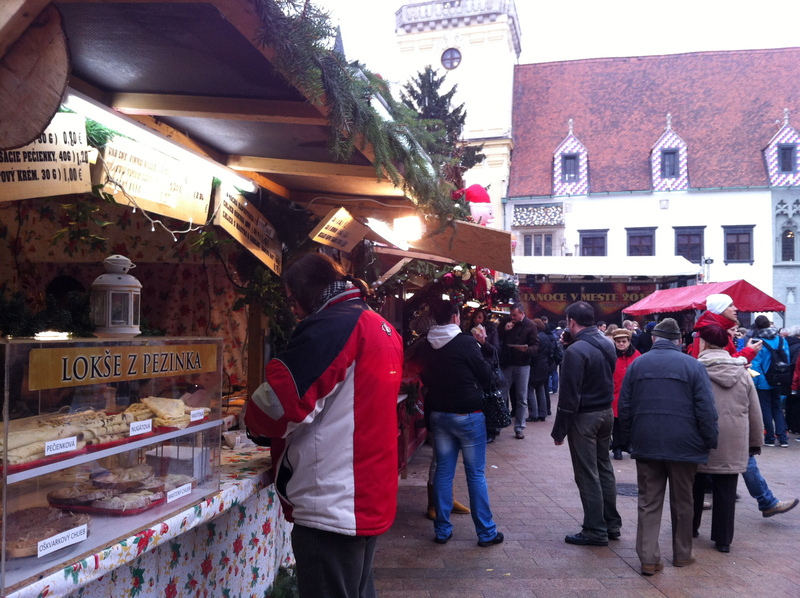 Never mind, I’ll be on a veritable Christmas market pilgrimage this week – with stops in Bratislava, Brno and Prague. For dinner last night I treated myself to an old and elegant looking bistro (Central) whose food and wine did not disappoint. Proudly featuring Hungarian wines exclusively I was pleasantly surprised by both the flavor of a Pinot Noir-style wine as well as the fact that the restaurant served it in a proper glass. 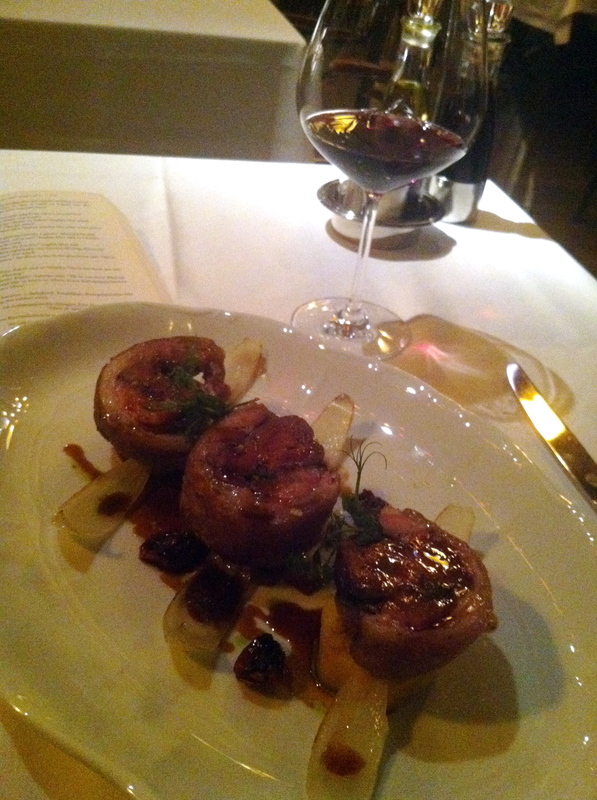 The warm mushroom salad was nothing memorable but the oven roasted pork leg…heavenly. Hungarians like their meat! After dinner I walked along the Danube and reflected on the history that has passed along its banks. There are tiles marking the reigns of Roman emperors…I couldn’t actually read them but could recognize that Flavius Csaszarok would have been Caesar Vespasian Flavius, the builder of the coliseum. 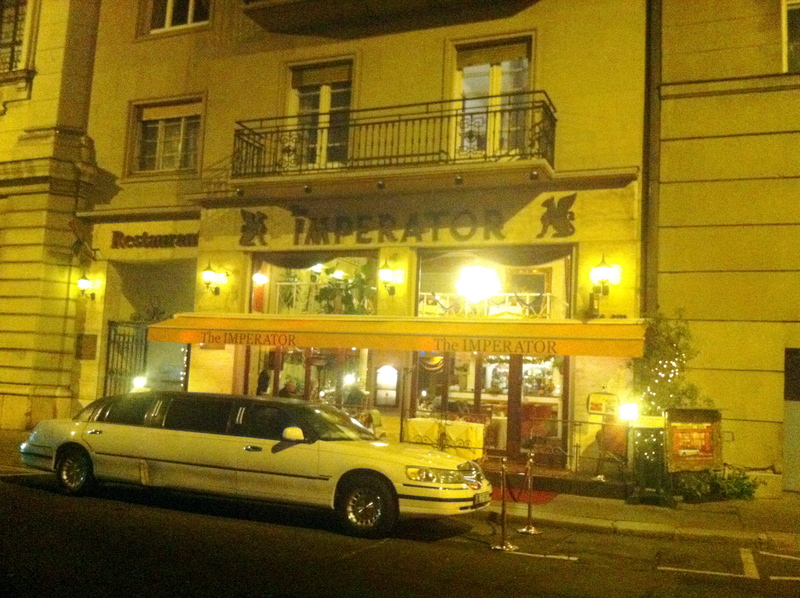 Further along, I smiled to see a posh restaurant called Imperator (the ancient military connotation of Emperor in Latin) along the banks of the Danube with a limo parked out front. I think Julius Caesar would have liked this.